The College Educator Development Program (CEDP) is a program for full-time college educators designed and delivered in collaboration with six western region colleges: Conestoga, Fanshawe, Lambton, Mohawk, Niagara and St.Clair. CEDP focuses on skills related to instructional design and delivery where the expertise of new educators is typically quite varied. The program is offered over a period of 3 consecutive spring terms in a conference format: Phase 1 runs in August; Phase 2 the following May, and concludes with Phase 3 the following year in June. The CEDP experience is an enjoyable learning opportunity, giving faculty the chance to gain strategies that will improve their teaching/learning and provide them with techniques that they can use immediately in the classroom. 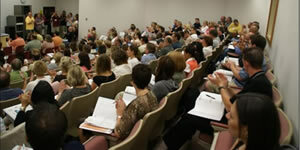 There is a mixture of mandatory foundation workshops as well as a number of workshop choices, allowing participants to select from a broad range of topics suited to one’s level of experience so that both new educators and those with more teaching experience will find workshops and hands-on sessions to suit their needs. The conference typically includes keynote speakers from the broader educational community as well as workshops facilitated by college educators chosen from the six participating colleges. Facilitators are all peers who have strong practical presentation skills and are models themselves of good teaching styles and techniques. The conference/residential format provides opportunities for collaboration and networking. Every year the Western Region PD committee works hard to keep the CEDP conferences current, rewarding, and challenging for our new faculty. If you are eligible to attend this program, you will receive information from your college contact.